This is where we left it yesterday, and I promised that I would show you what was in all of those packets. First though, stand with me for a minute as we look at that pile on the table. 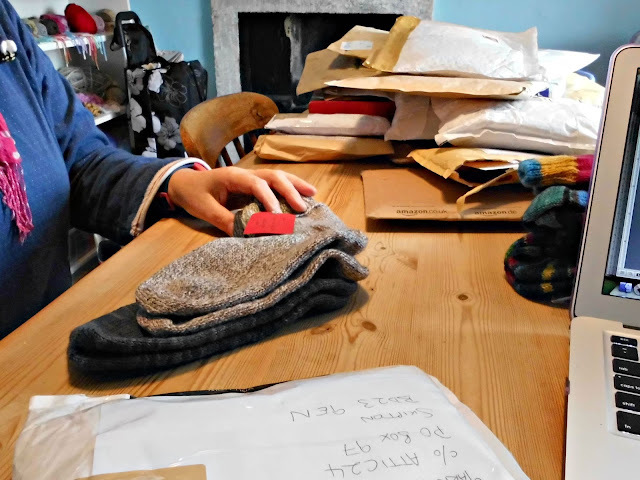 In every one of those envelopes, bags and boxes is something that someone has taken the time to knit and send to give to someone else who needs some more love in their lives. That's a huge pile of woolly love and my heart swells with gratitude just to look at them. Time to get to work. Lucy and I get a system going. 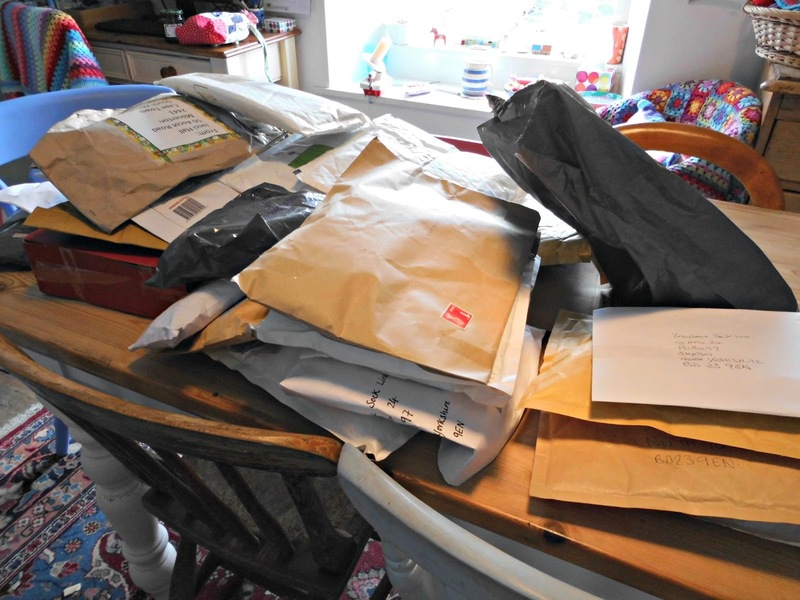 She's in charge of passing the parcels across the table whilst I get to open them and log them all on the computer. As you can probably imagine, it takes us quite a while! Not just because there's a huge pile of parcels to get through, but because we have to admire each pair, ooh and ahh over the colours of the yarns and the yarn content (these are some really beautiful yarns!) and read all the little messages on the tags. Even though I know they're not for me, each message makes me feel wonderfully special, so I know that when the socks reach their final owners they're going to make them feel fantastic. 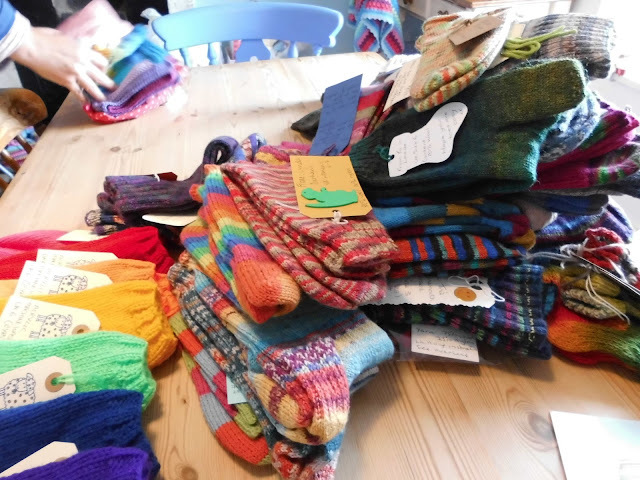 Eventually, we've got a pile of socks on the table. 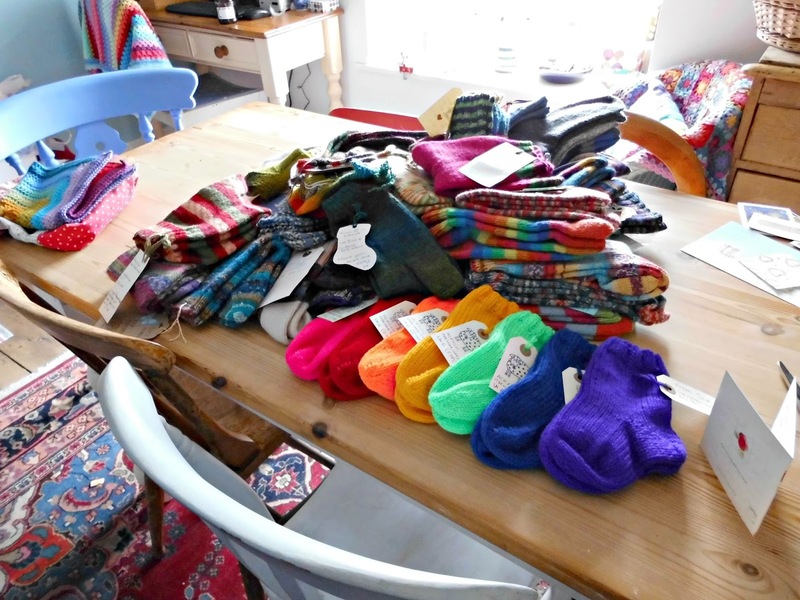 Lucy's Studio table isn't big enough to fit them all on to photograph, so we both scoop up armfuls of socks (and yes, at this point I really did think I was in sock heaven!) and carry them through to the bigger table in the cafe. 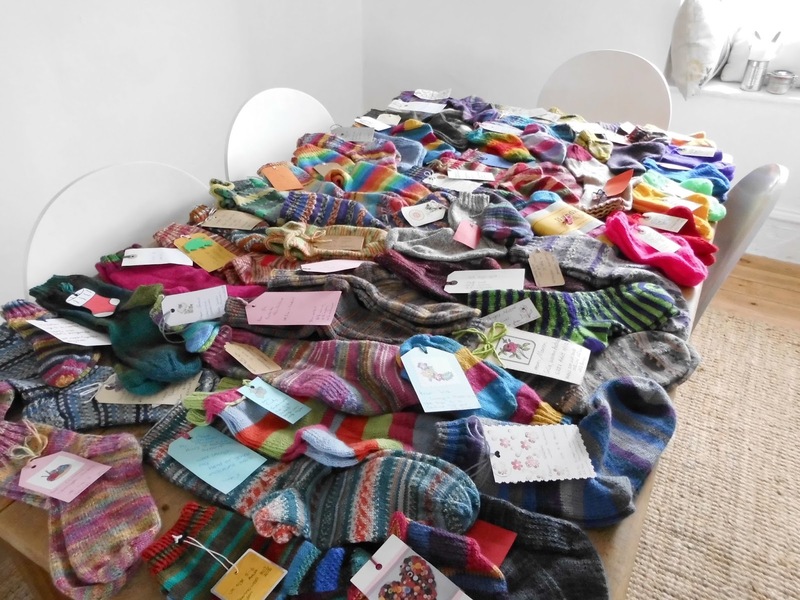 There are 52 pairs here, plus my own two pairs so that's 54 pairs of socks on this table. 54 pairs!! Can you believe it? I'm almost speechless to see them all laid out like this and it's really quite an emotional moment. All of this yarn from all over the world - from England, Wales, New Zealand, Australia and South Africa - and I know there are more pairs on their way from the corners of the globe too. Goodness. What a kind lot of people you are. Thank you! Can you see your socks? 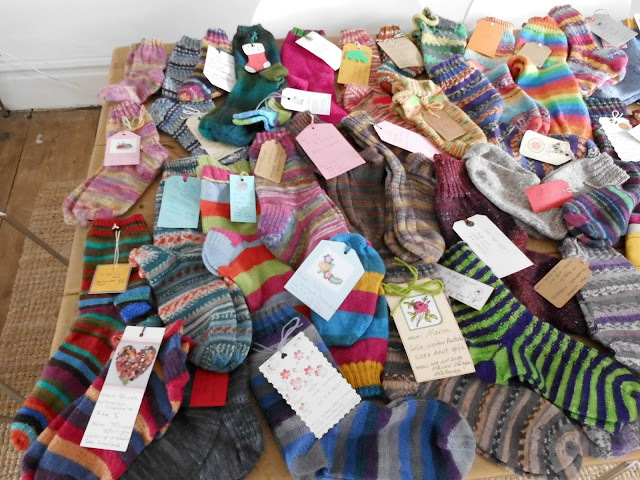 I tried to take photos so that you could spot them, although I will be photographing all the socks individually and putting the pictures onto Pinterest so that anyone can go and look at them. I'll also be keeping a list of everyone who's contributed too so that we can keep track of whose socks go where. 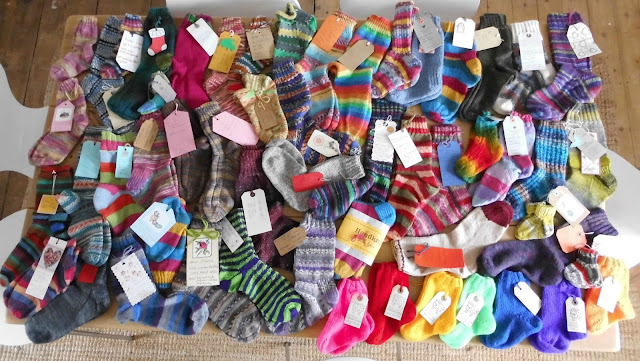 Socks of all shapes and sizes, plain and patterned, from tiny baby socks to huge man socks - they will all be on the Yarndale Sock Line and there will be even more photos for those of you who can't make it to Yarndale. 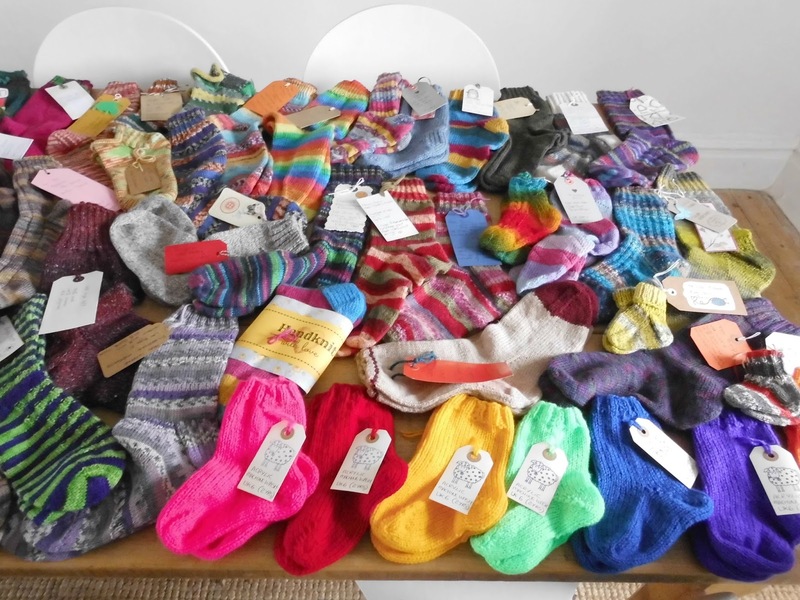 It's been a wonderful response to my original blog post about a charity sock knit and I'm touched that so many of you have wanted to get involved, especially when I know that some of you have only just learned to knit socks at all. 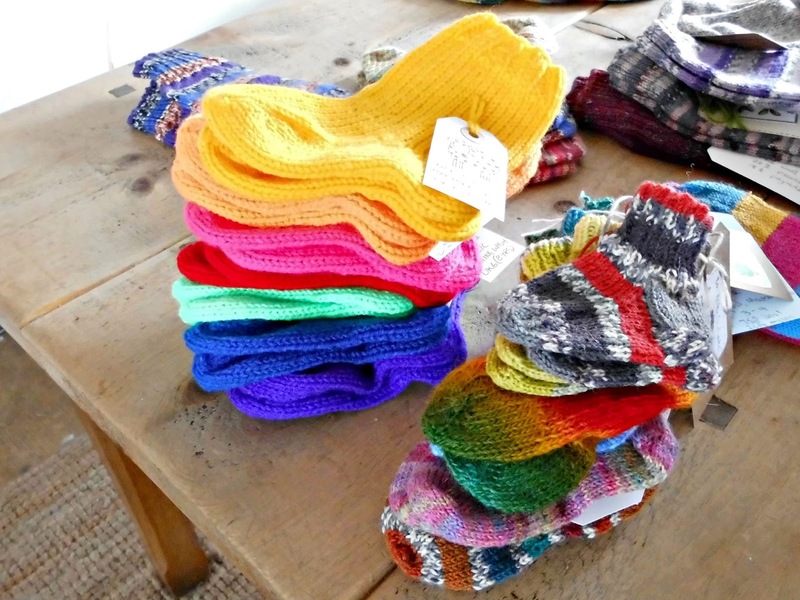 I can't wait to see them all up on the Yarndale Sock Line - only two weeks to go now! Don't forget that you can still get involved if you want to as you can bring your socks to Yarndale, and my local yarn shop, Black Sheep Wools, have kindly said that you can post them there now as I won't be back in Skipton until the Yarndale weekend. The Black Sheep address is Warehouse Studios, Glaziers Lane, Culcheth, Warrington, WA3 4AQ. I'll be there for a Sock Clinic on 16 September (11am-1pm) so I'll be able to pick up any last-minute socks then. I'll be busy now until Yarndale photographing the socks and getting the pictures up on Pinterest, so I'll let you know when that's done. 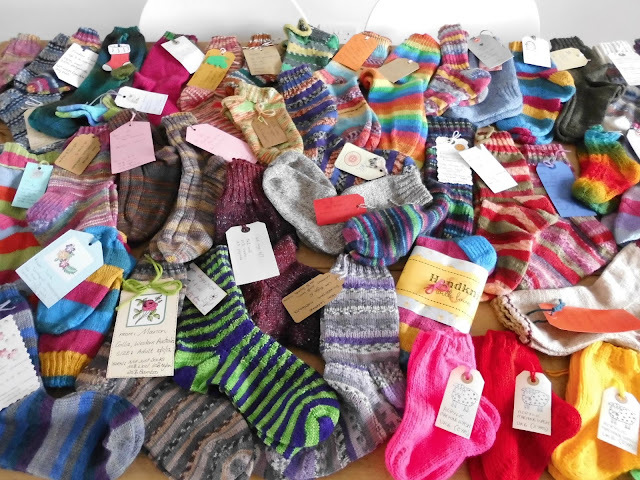 Thank you again for all of your socks, and for the messages and treats that came with them - and if you're not a sock knitter, for being part of this sock-fest by reading along! That's a great response. Yay! I can see my socks so I know they've arrived. That is an impressive amount! Wow, just wow! I couldn't take part as I'm so super slow at knitting - my first ( and only to date ) pair took ahem three years!!!! But well done to you and to every socker ( just made that up ) who took part! How wonderful! I can see mine (the pink tags helped them to stand out) - I'm sorry the socks weren't a very exciting colour, but that's not really the most important part of the whole exercise, I'm just happy to know that they'll go to a new home. Two more sleeps before Yarndale!